By now you all know that DTI data is a hard drive data recovery company that not only repairs damaged disks, but also provides data recovery software. We offer full version freeware, RAID diagnostics and file system viewers for our customers. We get a lot of questions about hard drives themselves, how they work and what are the steps that are taken to repair them. Since there is so much information on the Internet, we are going to do a series on what hard drives are and how they work. OK, so what does “magnetic media” mean? 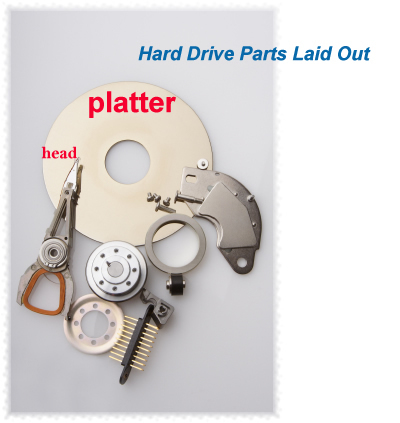 If you look at the graphic below it shows the different parts of a hard drive. The platters actually hold your data. They also hold a magnetic charge. The heads float over the platters on a buffer of air created by the spinning on the platters. The heads should never contact the platters since that will damage both the heads themselves as well as the data on the platters. Like the Earth, hard drive platters have a north and south pole. The relationship of where bits are stored according to the poles, determines if the bit contains a negative or positive charge. Each charge plus or minus reflects either a 1 or a 0, which can be translated into data. The motor spins up the drives to a certain RPM such as 7200, which is the most common rotaion per minute on modern hard drives. Once the platters are spinning at enough velocity to create the proper buffer of air, the heads will unlock and start to access the information on the hard drive. Information like the size of the drive can be sent to the BIOS and the computer can boot up. In most hard drive data recovery cases, the problems we encounter are considered “logical”. A logical hard drive data recovery involves repairing system files, partitions, boot files and system restore recoveries. This article is geared towards physical hard drive recovery which entails either repairing an electronic problem such as from a power outage or surge as well as head problems. 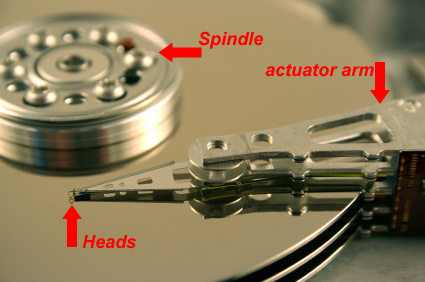 If you have ever had a clicking hard drive, then you have had a head problem. In our class 100 clean room, we can replace heads and allow a damaged hard drive to be read. Even though hard drive data recovery starts with the mechanical or electronic repair of the disk, that is not as easy as some of the videos you might have seen on YouTube portray. Every hard drive has its own firmware as well as its own language called micro-code that allows the drive to communicate with your computer. In cases where large capacity hard drives are clicking, the same exact heads are essential to recover data in a successful manner. If you run into a situation where your hard drive is acting flaky, slow, losing files or is showing you files but only allows you to see them not copy them, you have a serious problem. If your hard drive is clicking, whining, not spinning up or making a metal on metal grinding noise, you have a crises on your hands. It is essential that you stop trying to boot a hard drive that is showing signs of failure. In a lot of cases a professional hard drive data recovery company like DTI Data can recover the data without total parts replacement. If the hard drive gets to the point where the BIOS cannot see it, then hard drive data recovery is the last resort.